Caceres has one of the best concentrations of historic buildings in Spain. As a result of this, it has been declared a World Heritage Site by UNESCO. The buildings are constructed in brown stone on a hill top. Many of them have the coat of arms of the former owners carved in stone on the facade. Some are very decorative in style while others are very plain and austere. One of the best times to see the town is at night when the defensive walls and buildings are lit with artificial light - a good enough reason to stay in the Parador of Caceres. The Parador Caceres itself is in the building which was the Palace of Torreoraz. It was built in the 14th century for Diego Garcia de Ulloa, a knight of the Order of Santiago and has the family coat of arms displayed. The building is Gothic in style and incorporates an old slender tower. In the building, is an inner courtyard which is paved and has a small cloister around it. The interior has been converted to the luxury expected of a Parador but retains the atmosphere and many of the original pieces. Of particular note is the original mantelpiece in the living room. Stone or wooden floors, wood beams and stylish furniture make for attractive living rooms. The bedrooms are decorated in soft cream shades and are spacious and comfortable. Some might like to try the frog legs mozarabe style while others will prefer roast lamb or pork with fried potatoes. While in the area, visit the Virgen de la Montana sanctuary. Also the prehistoric paintings of Maltravieso Cave and contrast this in the Vostell Museum of Modern Art in Malpartida de Caceres. Local festivals include the "Festival of fire of San Jorge" held on April 23rd and the ”romerias” of Montana and Santa Lucia on the first and second Sundays of May. Also in May is held the Womad Festival of World Music. One of the features of the town are the storks who come in February to take over the abandoned nests of the previous year. They like the top of churches or other high perches and live in perfect harmony with the humans below. 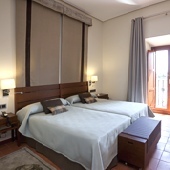 The Caceres Parador has twenty eight twin bedded rooms, eight rooms with a double bed, one suite and one bedroom with easy access, all of which have a private bathroom. The rooms all have a telephone, cable television, safe and mini bar. There is heating and air conditioning throughout the hotel. 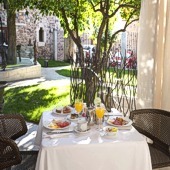 The Parador has a restaurant and a bar, piped music, currency exchange, lift and parking facilities (without security and limited places), garden and cable TV. A conference room is also available. Distance from the nearest airport is approximately 89 kms and the nearest train station is 3 kms away. This was the last of five paradors we stayed in on our trip, all of which were very comfortable. As regards Caceres, the room, was a little cramped - much. much smaller than the ones in the four previous hotels. We were also disappointed to find that there was no cafe service in the garden, this being reserved for the restaurant. Although we took our drinks outside, the staff did not seem to like this. We stayed here on our way from Porto to southern Spain. It was one of our trip highlights. A beautiful structure and a lovely room which was very clean and well supplied. The fellow who met us on arrival helped us to get our car to the parkade and he also went out of his way to book us our tour of the Alhambra inGranada (no small undertaking). We found a wonderful restaurant a few minutes from the hotel in the main square. The breakfast that was included was probably the best we have encountered. We would look forward to staying there again. 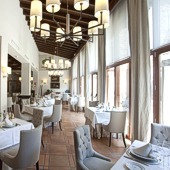 Caceres maravilloso y El Parador muy bueno , la atención del personal muy buena y su restaurant buenisimo. Mi unica critica es que teniendo un lugar tan maravilloso como es un palacio del siglo 14 con influencias moriscas la decoración de las habitaciones deja mucho que desear (estilo Ikea). Creo que es una muy buena oportunidad de mejorar la decoracion para que la experiencia sea perfecta. The Parador in Caceres was wonderful. The town and the buildings were charming. However the most impressive part of the stay was when I found that I had left my passport in the previous Parador in Toledo and did not know what to do short of driving 2-1/2 hours back to get it. The two gentlemen at the desk (sorry I did not get their names) both spent almost a 1/2 hour offering ideas from train transportation for my partner on to Lisboa (so she would not have to drive 5 hours with me) to arranging for delivery of the passport to our final destination in Barcelona. That type of caring assistance was above and beyond expectations - and all with a smile and empathetic attitude! Muchas Gracias! Luxury Parador hotel in a fourteenth century palace in Caceres.